If you have a will, you're already one step ahead of most people. According to a recent survey by Caring.com, 60 percent of U.S. adults don't have a will or a living trust. If you've recently gone through one of these big life changes, it's time to sit down and update your estate plan. 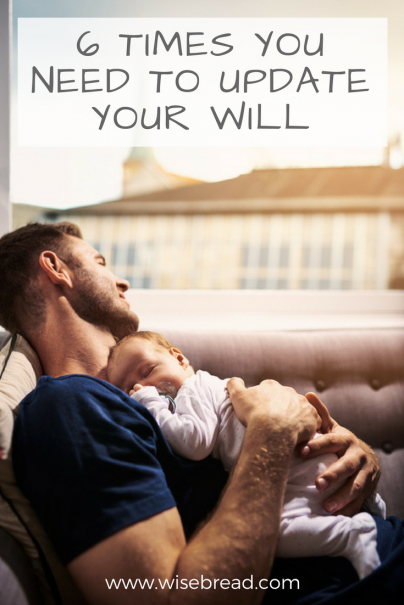 A will that designates what goes to your spouse will make things easier on them when you die. Joint property ownership is automatically turned into complete ownership by the surviving spouse after one spouse dies, and that can't be changed by a will. However, the surviving spouse will need a will to direct what to do with the house after they die. Also, some things may not automatically go to your spouse as a beneficiary if you haven't updated your will. For instance, say you receive an unexpected inheritance just before you die, such as the house of a long-lost relative. Is that joint property with your spouse? Not if it isn't listed in your will. Such assets could go to probate, which is why it's better to have an updated will. A marriage adds a person to your life who should be added to a will; in a divorce, you may want to remove that person from your will. Do you want to leave your grandmother's jewelry to your ex-wife? Many people would say no. You may also want to update your will after a change in relationship with any other member of your family. Maybe the executor of your will who you named years ago is no longer of sound mind and capable of doing such duties. Or maybe someone you've left a large asset to has died. These are all reasons to update a will. When a child is born, it creates a potential new heir. A will can declare who you would want to be the guardian of your minor children upon your death. Otherwise, if you don't have a will and have young children, your surviving spouse may have to go to court to be appointed guardian of the children's property, according to Sherman Silverstein, a law firm in New Jersey. If a husband and wife die simultaneously without wills, the state may take over the care and support of minor children, and name relatives or someone else to take over their care, according to Silverstein. That's why it's important for both parents to have wills. If an heir dies before you do, anything left to them upon your passing could be in flux if your will isn't updated. Without any named heirs, property may pass to the state instead of to friends and relatives. If your spouse dies before you while any of your children are still minors, you'll want to update your will so that you can direct relatives and friends to select a guardian that they agree upon in case of your death. You also may want to direct the probate court to make the selection in the case that the relatives and friends you named can't agree on a guardian. Buying or selling a house is a major life event and can be a reason to celebrate. It can also be a reminder that it's time to update your will. As stated above, joint ownership of a home will pass on to your spouse if you die without a will. But other circumstances, such as your spouse also dying, can create the need for a will when you own property. If you're moving out of the state where you executed your will, check with an attorney in your new state to see if the will is still valid. State laws for wills can vary, and you shouldn't assume yours meets the requirements in your new state. If your estate has had a substantial increase or decrease in value, then it's time to update your will. This can include your stocks increasing substantially in value, the sale of a major asset, the founding of a business, or anything else that has a big impact on your finances. You may want to change how much you give to one beneficiary over another, for example, or leave a new business to your daughter who is interested in it. Whatever life events come at you — and whenever — it's a good idea to review your will every year. A will is meant to disburse your assets according to your wishes. And those wishes may not be so easy to follow if your will has old information.